On 3 December 2018 HOSPEEM and EPSU organised in the European Parliament in Brussels the social partners’ dissemination workshop entitled “Taking stock and the way forward”. The workshop gathered approximately 30 participants from health professional organisations as well as actors from the employment sector as well as EU institutions and agencies. The event was hosted by MEP Jana Žitňanská (ECR, Slovakia), rapporteur of the EP Report on Pathways for the reintegration of workers recovering from injury and illness into quality employment (2017/2277(INI)), adopted on 12 June 2018, co-hosted by MEP Brando Benifei (S&D, Italy) and moderated by Lodewijk Buschkens, EU-Affairs Manager, StAZ (Dutch Social Partner Organisation for Hospitals). In a written message to the workshop MEP Brando Benifei underlined that “the well-being, economic independence, self-determination and motivation of the [workforce] are key factors of ambitious recruitment and retention in the healthcare sector and in the provision of quality services for end-users.” He also underlined that “The healthcare sector needs a supportive legislative framework for the social dialogue between employees and employers in all Member States and transnationally, and recognition of its values to the economy and society”. The workshop event helped to present and discuss the main outcomes from two joint projects on Continuing Professional Development (CPD) and Life Long Learning (LLL) and on Occupational Safety and Health (OSH) – focusing on musculoskeletal disorders and psychosocial risks and stress at the workplace (PSRS@W) with the EU-level partner organisations of health professionals and health management as well as with the European Parliament, the European Commission and EU-OSHA. Read more on the first project focusing on MSD and PSR and done between 2014 and 2016 on the HOSPEEM or EPSU webpage and on the second project focusing on CPD & LLL and taking again up MSD and PSRS@W, started in late 2017 and ending in early 2019, on the HOSPEEM or EPSU webpage. To better disseminate the projects’ results at European and national level a media toolkit has been prepared by the HOSPEEM Secretariat containing all relevant links to the dedicated webpages and project deliverables (reports, media releases, videos, graphical recording etc.). A video message from Marta Branca, HOSPEEM Vice-Secretary General presented an overview of the importance of continuous training and recruitment and retention policies for healthcare workers across Europe. 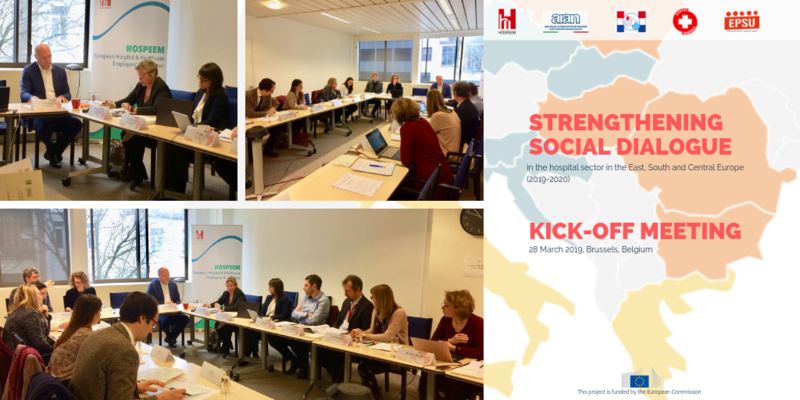 Nico Knibbe, project consultant, gave an overview on main insights from four conferences organised between 2015and 2018 in the context of the two projects “Assessing health and safety risks in the hospital sector and the role of the social partners in addressing them: the case of musculoskeletal disorders and psycho-social risks and stress at work” (2014-2016) and “Promoting effective recruitment and retention policies for health workers in the EU by ensuring access to Continuing Professional Development and healthy and safe workplaces supportive of patient safety and quality care” (2017-2019). In his presentation he also illustrated some of the take-home messages elaborated at the four conferences in Paris (HOSPEEM – EPSU), Helsinki (HOSPEEM – EPSU), Amsterdam (HOSPEEM – EPSU) and Vilnius (HOSPEEM – EPSU) and contained in the four conference reports. Participants also listened to two presentations illustrating good practices developed and implemented by national social partners in Denmark and in the Netherlands. Jette Steenberg Holtzmann and Winnie Lund, Capital Region of Denmark, presented the so-called “Bridge Model”, a competence development programme designed to enhance interprofessional collaboration between professionals and institutions of the hospital sector, of primary care and social care. Have a look at their presentation, a video the presenters showed and an information brochure on the bridge model. Anouk ten Arve, Stichting IZZ, presented insights from a research showing that organisational differences in the health care utilisation of health care sector employees are related to differences in the organisational climate and that healthcare organisations with a positive organisational climate score lower on musculoskeletal disorders (MSDs) and emotional exhaustion. Have a look at their presentation, a video the presenters showed and an information brochure on the IZZ research and project. Mathias Maucher, EPSU, and Simone Mohrs, HOSPEEM, concluded the dissemination workshop by elaborating on some of the planned next steps by HOSPEEM and EPSU, building on the insights and take home messages from the two projects. For the first project HOSPEEM and EPSU agreed on planned follow-up activities, contained in a document with the take home messages from the conferences in Paris and Helsinki. For the second document this document still has to be finalised until early 2019. The dissemination workshop offered the opportunity to connect and exchange ideas between sectorial social partners’, experts in the health and employment sector as well as decision-makers. EPSU also published an article on this topic. All the videos of the EPSU-HOSPEEM Conference “A sound mind in a sound body – taking care of those who take care of us” are available on the conference webpage. 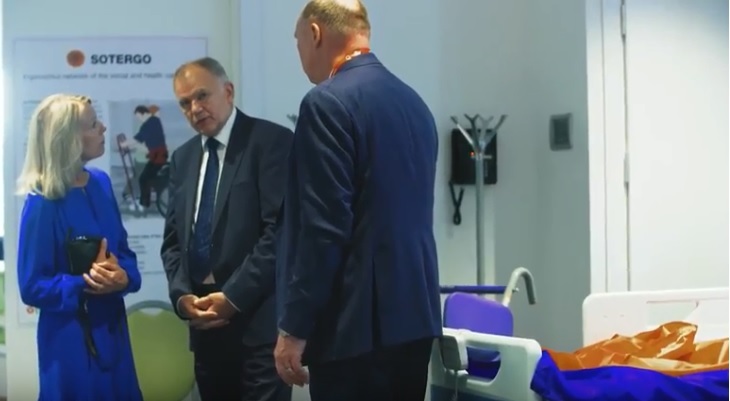 All the videos and the video teaser of the EPSU-HOSPEEM Conference “A sound mind in a sound body – taking care of those who take care of us” that took place on 23 & 24 May 2018 in Vilnius have been released! On 23 and 24 May 2018 the second conference of the HOSPEEM–EPSUproject “Promoting effective recruitment and retention policies for health workers in the EU by ensuring access to CPD and healthy and safe workplaces supportive of patient safety and quality care” (2017-2018) took place in Vilnius (co-organised by LSADPS and supported by EPSU). The aim of this conference on Occupational Safety and Health was to pursue and expand the social partners’ thematic focus on the prevention and reduction of MSD and PSRS@W.
Check all the videos on the Vilnius conference webpage on the HOSPEEM website or on the EPSU website.